The musical life of Penwith is lively and varied, involving an unusually high percentage of people in the community. Numerous groups, organizations and individuals pursue a wide range of styles and interests, ranging from Cornish traditional music through folk, jazz and classical, to pop and rock. Young people are actively involved in all these areas. West Cornwall has a strong tradition of choral singing and of brass and silver band playing. Penzance Choral Society is the largest and one of the oldest choral societies in Cornwall. As well as an annual oratorio it gives concerts, including Christmas performances of ancient, modern and Cornish carols. A recent performance of Handel’s Alexander’s Feast was the first Cornish performance for 200 years. The Marazion Apollo Male Voice Choir, the Newlyn Male Choir, the Orpheus Ladies Choir and the Mousehole Male Voice Choir are nationally known and respected. In addition, Penzance, St Ives and St Just each has its own amateur operatic society which stage annual shows. The Penzance Orchestral Society, now in its ninetieth year, gives regular concerts, usually including a professional soloist. The International Musicians Seminar, founded and directed by Sandor Vegh and under its musical director Stephen Isserlis, is based at nearby Prussia Cove. Master classes are offered together with opportunities to hear chamber music of international quality in a number of local performances. The well-known composer George Lloyd was born in Cornwall and his first opera was performed in Penzance. A number of composers now live and work in Penwith, creating music of various styles. Several recording studios provide a range of facilities and cater for many needs. 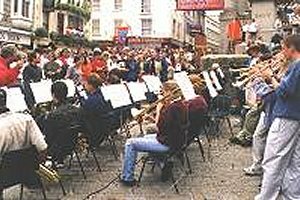 There are strong and long-standing jazz and folk followings in Penwith and many groups and individuals perform regularly at a number of venues. Visiting artists of the highest repute play frequently to enthusiastic audiences. In recent years, the formation of a steel band at Cape Cornwall Comprehensive School at St Just has added a Caribbean touch to the musical scene. Penwith has much to offer to anyone wanting to pursue musical interests of any kind, whether as a listener or active participant.